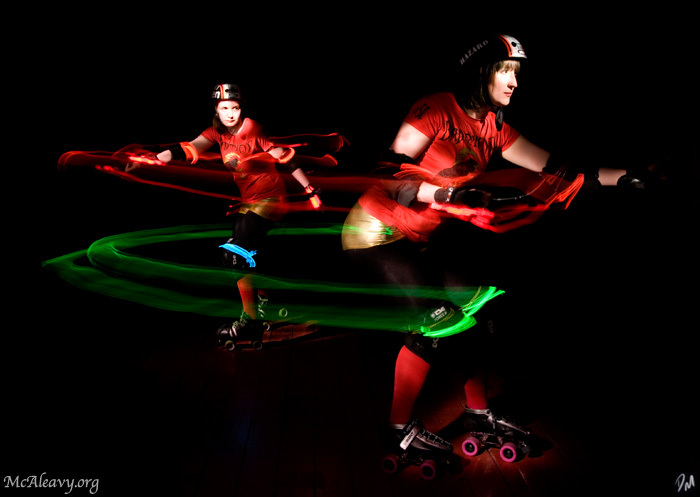 Well here is the next image in the rollergirls series. If one rollergirl is good, then two can only be better so I give you Slain Austen (rear) and Chemikill Hazard (front) of the Glasgow Roller Girls executing a maneuver known as a whip. One skater slingshots another past opposing skaters. Studio assistance for this electroluminescent whip was provided by teammates Wild Oates and Sykes. Thank you ladies.